From transport to mixed-used development and leisure, from energy to critical power and water assets, national-level investment priorities such as UAE’s Vision 2021, Qatar World Cup 2022 and Saudi Arabia’s National Transformation Program 2020 are driving an unprecedented level of infrastructure investment. In a region noted for embracing the latest technologies for innovative infrastructure, there is currently a major opportunity to improve the lives of citizens by providing better connected assets for transport, utilities and other key services. The “Smart Infrastructure Summit” will discuss and debate the various technologies and systems that bridge the gap between ‘Now’ and the ‘Future’. 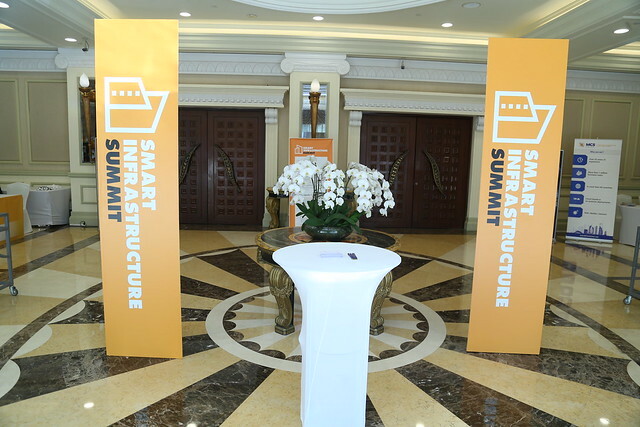 Bringing together more than 200 delegates comprising of government officials, key decision makers, influencers and solution providers, the Smart Infrastructure Summit 2017 aims to connect minds and bring new ideas and possibilities to a rapidly growing industry. Be more productive and efficient by reflecting on your learning and highlighting gaps in your knowledge and experience. Attend the CPD workshop case study to further enhance your knowledge about the technologies and techniques being employed in the development of Smart Infrastructure. Wafa Al-Sabbagh joined the Ministry of Infrastructure Development in 1981, then established Design center in 1983. Got promoted as a Senior Engineer in 1995 and then as a Chief Engineer in 2000. Held the position of Head of Planning and Design section in 2008 and become the Deputy Director of the Maintenance Department in 2010.Epert at public work sector 2017 Worked on various types of project and studies as Design Green Buildings for the new Extensions for Maintenance Department 2010:2012, Strategic study for saving Energy plan For Ministry of Public works by using control systems for the Federal Government Buildings 2012, Strategic study for Facility management plan for federal government buildings 2012, Proposed saving Energy study case for ministry of public works buildings saving 50%, Pilot projects for saving energy in Al-Rashydia clinic Dubai saving 30%, Pilot project for saving energy in Al-Etihad clinic Dubai target 50%, Road map study for Sustainability for federal government buildings 2014-2016. Wafa is team leader for work shops to educate endures how to maintain their buildings and a team leader for developing the building materials Cods for the maintenance projects from 2013- 2016 and was the team leader for Sustainable Maintenance in 2011.2016:2107 case studies on smart building for hospitals, courts, community. Wafa has a futuristic vision and loves it push the boundaries aiming high for a better United Arab Emirates. Dr. Prashanth Marpu is an Assistant Professor at Masdar Institute of Science and Technology, Abu Dhabi, UAE. His specialization is in environmental data analysis, image processing, data mining, machine learning, remote sensing, GIS and IoT. Prior to joining Masdar Institute, Dr. Marpu was a researcher at the University of Iceland, Reykjavik, Iceland. Before that he was a Marie Curie Fellow at the University of Pavia, Italy working on developing advanced methods for remote sensing data analysis. Dr. Marpu holds a PhD from Freiberg University of Mining and Technology, Germany and MSc in Wireless Engineering from the Technical University of Denmark. He has developed approaches for automatic change detection in multi-temporal remote sensing images, spectral-spatial classification of data, hyperspectral image processing and non-linear methods for modeling hydro-climatic variables along with recent studies on urban heat island effect in desert cities. He is also working on developing advanced wireless sensor networks based on IoT paradigm and is also involved in designing and building small satellites. Andy Noorigian has a lead role in Hyperloop One’s business planning for the Gulf region. He was previously Director of Corporate Strategy and Development at United Technologies. He has a banking and finance background with experience at Credit Suisse and boutique Wall Street firms covering Industrials and Aerospace. He holds degrees from Georgetown University and the University of Illinois Urbana-Champaign and is a registered CFA and CPA. Steven Lambert is COO and partner at MCS, a high-tech firm focused on integrated real estate, facilities and workplace software and technology solutions for private and public organizations. He has 20 years of experience in leading large scale operational transformation projects with budgets up to $100 million impacting across all functions of Fortune 1000 companies in Europe and USA. After graduating from the Wharton Business School in 2001, he worked with blue-chip tech companies in transforming their service operations. At MCS, Steven runs the global operations in IWMS consulting and software implementation, with a strong background in latest technology like IoT. When he is not obsessing with real estate, he loves to sail. Chris Venemore is the civil infrastructure director at AECOM with responsibility for the design of all road, bridge, marine, energy, environment, water and geotechnical projects within Oman and the UAE. He is responsible for the development, growth and management of the multi-disciplinary design group including day-to-day management of bidding, business planning, monitoring of financial performance and business development. Chris has worked extensively in infrastructure both in the UK and Middle East with over 29 years’ experience in the infrastructure arena, 16 of those in the Middle East. His professional interests focus on business management and the leveraging of the latest technology to enhance client satisfaction. He is a Chartered Engineer and a member of IET Institute of Engineering and Technology, IAM the Institute of Asset Management, APM Association for Project Management, and CIWEM the Institute of Water and Environment Management. In his personal time Chris enjoys spending time with his family and, when time allows, tinkering with cars. Wilson Craig is the Intelligent Transportation Systems (ITS) Lead for AECOM Middle East. He is a Chartered Engineer with the UK Engineering Council, and brings over 25 years’ engineering experience within traffic and related environments. Before moving into intelligent transportation systems, Wilson worked within the telecommunications, avionic and automotive industries. He has around 13 years’ specific experience in ITS gained in the UK, Europe and the Middle East. During this time he has gained experience in managing the design and implementation of large ITS schemes, and has an interest in the development of Smart Cities from an ITS perspective. Andreas Kolb is the co-founder and co-Managing Director of Smart4Power an energy service company providing energy savings solutions for retrofit projects in existing buildings and facilities. With the clear focus on delivering energy savings, S4P has already implemented more than 40 projects in the UAE and GCC countries through which its clients enjoy energy savings of more than AED 14M annually. Identifying the opportunities and requirements for energy efficiency service at an early stage has positioned Smart4Power as one of the leaders in the UAE ESCO sector. Andreas is resident in the UAE since 18 years and has been fully engaged in new construction and retrofit projects, working closely with MEP companies in the implementation of customized smart solutions. During his years of multinational corporate experience, Andreas led the Finance & Operations functions of Compaq and HP Middle East from a small sales entity to a regional force covering 24 countries with a team of over 1,000 employees. Andreas holds an MBA in Finance and Capital Markets from Zurich University, Switzerland. Labib Matta is a Chief Business Officer at NXN. With extensive experience in consulting and telecom operations, Labib spearheads the Smart City Services development of NXN and works across multiple geographies in the region. Labib is focused on developing the organizational, technical and go to market requirements to drive effective Smart City transformation. Mohammed’s experience spans 24 years across Kuwait, Jordan, Egypt, KSA, UAE, Lebanon, and Qatar. As the Executive Director of Operations, he oversees a team of design project managers handling a multitude of mixed-use developments, luxury residential, and hospitality projects. He possesses in-depth knowledge of construction feasibility studies, cost analysis, and litigation/arbitration management. Akin Adamson is TRL’s (Transport Research Laboratory’s) Regional Director for the Middle East, providing world leading Transportation Research and Consultancy to Public and Private sector organisations. He has extensive advisory and research experience across multiple industries including Transportation, ICT and Energy. Akin works across the full range of TRL’s capabilities covering Road Safety, Transportation, Infrastructure, Sustainability and Testing & Assurance. He is the focal point for all projects in the Middle East region, spanning research, policy development, strategy formulation, solution implementation and performance measurement. Doreb studied in NED University of Engineering and Technology and holds a Master’s degree in Electrical Engineering. Doreb Ebrahim is currently the Technical Advisor to The Chairman at Sharjah Electricity and Water Authority (SEWA) U.A.E. He joined SEWA in 1999. Doreb has a broad experience in Planning, Maintenance, Projects and Engineering and has worked with other Electric Utility Companies in the last 28 years, mainly in the field of Power, SCADA and Communication Projects in the utility environment. Anas Kassem is one of WSP | Parsons Brinckerhoff’s long serving senior managers. He has over 28 years of experience in the industry and currently oversees all of WSP | Parsons Brinckerhoff business related to Transport & Infrastructure including Project and Programme Management in the Middle East which includes road, rail, aviation and marine markets, with over 600 staff in his business unit. Anas has been actively involved in a direct management capacity in the delivery of many large programs and projects including Kuwait Motorways Project, Qatar’s Ashghal’s Programme, Makkah Public Transport Program, Riyadh Metro Programme. Yousef is a Senior Partner at NXN Group, the region’s leading Smart City and Digital Transformation consulting and managed services firm. In his role as the head of the Smart City consulting practice in the UAE, Yousef oversees some of the world’s most ambitious Smart City, Smart District and Smart Government transformation engagements in the world, and manages executive client relationships. Vice President, Middle East - Over forty years in the Construction Industry in Europe, the Middle East and Far East working for some of the largest and most prestigious Consultants and Contractors in the world on some of the most renowned major projects in all markets. Eighteen years in the Middle East and now the VP for Business Development for the region. Mohamed is a Sustainability Officer with experience in CSR, GHG Accounting, and Sustainability Reporting & Communications. He currently supports the development of corporate sustainability reports in accordance with international standards such as the Global Reporting Initiative (GRI) guidelines and the development of niche new concepts. He supports all external relations, collaborations, and marketing communications. Currently Dr. Pablo is the PMO Director at Dubai Carbon Centre of Excellence (DCCE) where he provides technical support, management and expertise on sustainability. His particulars areas of expertise are energy and waste management in buildings, Green House Gases (GHG) accounting, energy auditing and management and LEED certifications. Sougata Nandi is the Founder of 3e Advisory, a firm that specializes in setting Cleantech start-ups on a sustainable business model and 3e Apps, a company based out of In5 Dubai Internet City, developing Apps for Energy & Environmental Efficiency. Sougata was the second LEED AP from the UAE in 2005, led the Green Building movement in UAE by delivering 6 of the first 12 LEED certified projects. Sougata also set up the Emirates Energy Star program, a M2M based Remotely Managed Energy Management Program, which became the fastest growing energy management program in the World with 100 projects in 2 years. Sougata is currently promoting IoT based Solar PV and Energy Management in the UAE and Saudi Arabia. He also works as a Sustainable Development Evangelist through his work as Judge on Smart City App Hack, HULT Global Case Challenge and Climate Control Awards. How can we encourage asset life value thinking over short-termism? What are the main organisational challenges? What are the major technical challenges? What are the main people challenges? Defining the technologies of “Smart” and why they are game changing: IoT, M-2-M, big data analytics etc. Why Continuous Professional Development (CPD)? Continuous professional development (CPD) is an essential component in maintaining the skills and knowledge of construction professionals working in the GCC. Taking the time to actively stay up to date in this dynamic industry is crucial to keeping pace with changes affecting how we do our jobs right through to career development and future prospects. Taking a proactive approach to your development can help you to stay on top of changes in your industry, while also demonstrating a clear commitment to personal professional improvement. That’s why the Smart Infrastructure Summit 2017 will host accredited CPD workshops open to all registered attendees of the event. These certified workshops have been integrated into the conference agenda and will take a look at pivotal technical issues influencing the way Smart Infrastructure is used in this region. The knowledge gained through attendance could be vital to your next project, or the point of difference that secure you your next contract. How do I receive my CPD certificate of attendance? Attendees of the Smart Infrastructure Summit will have the opportunity to receive a digital Certificate of Attendance to attach to their CPD log as evidence of development once training is complete or the desired standards of learning have been met. To receive their certificate, attendees are to submit their details, via an online form which will be available after the event has taken place. The link to the online form will be visible on www.smartinfrastructuresummit.com from April 27, 2017 until May 31, 2017. You will then receive the certificate by email. What will be included in the workshop? More information on the individual workshops coming soon. Listen and learn from the region’s foremost experts as they explain how the future of Smart Infrastructure will change the way the construction industry operates. Utilise the accredited CPD workshops to get the most out of the Smart Infrastructure Summit 2017. Not only will you be able to increase your knowledge and understanding, but you’ll also be able to add the workshops to your own personalised development plan. The Smart Infrastructure Summit 2017 presents you with an opportunity to interact and discuss how Smart technology can benefit your company with the region’s leading experts. With several breaks scheduled for networking, you’ll be able to get one-on-one time with panelists and presenters, following on from interactive Q&A sessions and a CPD workshop. The Smart Infrastructure Summit 2017 offers you a chance to reach out to all relevant industry professionals as well as key government representatives. Engage with a captive audience of decision makers and influencers, who are involved in purchasing or specifying products and services. As a sponsor of the Smart Infrastructure Summit 2017, we can create a package that is tailor-made to help you reach your objectives.